Locker Group’s fixing systems provide enhanced versatility to our architectural range, with a variety of internal and external uses and bespoke design functions. Useful in structural designs as balustrades or facades, or visually striking as art installations and external landscaping, their architectural potential is limitless. Where can I use Locker fixing systems? Locker Group’s fixing systems are designed to be used in conjunction with our range of metal architectural meshes – either woven wire, perforated or expanded metal. The standard range of fixing systems offer fast and simple installation options, whether they are framed and tensioned, or are no-frame hidden solutions. The versatility and popularity of our fixing systems means that we have multiple offerings for the product, catering to the needs of your architectural project and design intent. Alternatively, our contracting design team will develop a bespoke fixing method to suit the requirements of your project, whether for fast installation, no-framed invisible fixing, or both. Indeed, high demand for fixing systems encourages us to innovate with materials and designs to continue expanding our range. The benefits of Locker fixing systems lie not only in their flexibility of installation, but also in their versatility. Equally functional in interior and exterior use, they are designed for durability in all atmospheric conditions and are the ultimate complement to any architectural project. What are the applications of architectural fixing systems? On the inside of your building, fixing systems can add to interior detailing, balustrade infills for improved safety and functionality or be used to complete facades. Externally, fixing systems have been used to mark landscape redesigns and architecture, and to create visually-innovative sculptural art installations with an industrial edge. A coming together of functionality and durability with visual appeal – a true must-have. Architectural fixing systems have been used by our clients in a range of applications. Developers AMP Capital reached out to Locker Group for assistance with redeveloping Vogel House in Wellington, New Zealand, with a brief on providing screening for a stairwell that was to be both decorative and functional. Matching their brief with success, Locker Group provided technical assistance on designing the wire mesh installations and the fixing systems, with the work completed in mere days. Supporting architectural innovation with fixing systems that work are part of what Locker Group are all about. 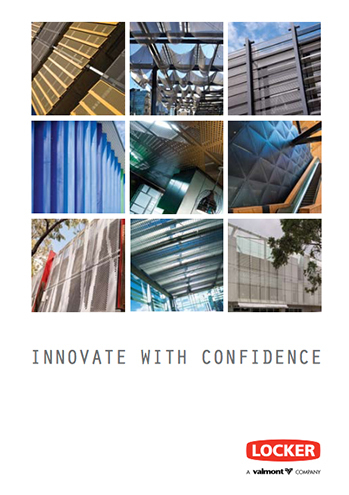 For more information on our architectural range of fixing systems in woven wire, perforated or expanded metal, or details on installation, contact our expert team today.